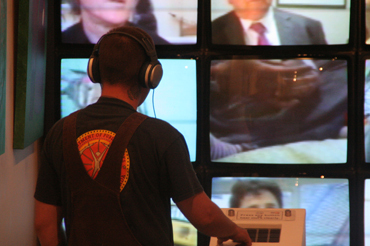 This interactive video wall allowed attendees of the first Know Drugs event to select one of sixteen interviews on the topic of drugs to appear full screen and in stereo sound. 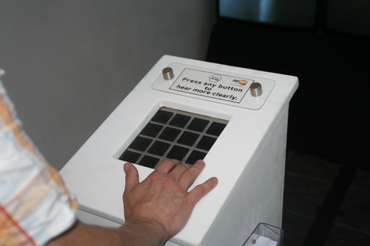 In front of the interactive video wall stood a podium with a 4x4 grid of touch button pads, which each corresponded to one of the CRT TVs which made up the video wall in front of them; and it was this grid of pads that users pressed to interact with the installation. At the touch of one of these buttons, the cacophony of noise generated by all 16 interviewees talking at once, from medical professionals, law enforcers, drug users and ex addicts was drowned out and the monologue of the chosen interviewee could be heard. Pressing another button returned the user to the beginning, where they were free to choose another interviewee to listen to. 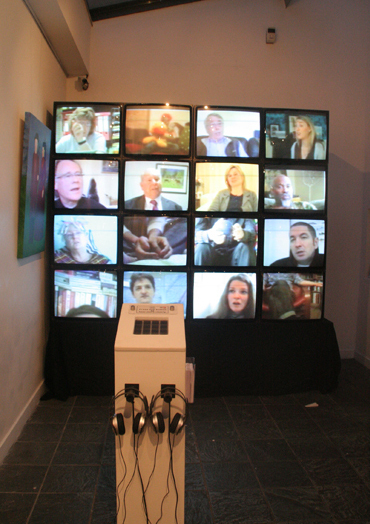 The installation was designed with the idea in mind that there are many different and often conflicting voices and opinions on the matter of drug legislation, and if we are to make progress in this area, then it is important to be able to ignore the noise, and concentrate on listening to expert viewpoints, even if they differ from our own. A close up of the interactive video wall’s touch panel.